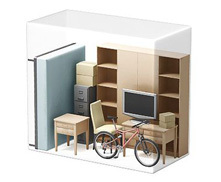 Whether you are a Company or a Self-employed worker, for sure many times you run out of space to store your products or tools so you need a space solution in order to continue with your professional activity. To solve your lack of space we designed our storage units so you can store among other things; office archives, equipment, merchandise, and as we believe you should have access at any moment, our facilities are located next to a main road access of Valencia where you can drive your vehicle inside and carry the trolleys we offer to facilitate the loading to your storage room, all with the security of having a digital 24 hours CCTV, alarm connected to the police and controlled access to facilities customized for each client. Our facilities are used by a variety of business sectors like retailers among others. Many types of companies use our services to store safely a variety of documents including: financial documents, medical records, licenses, patents, drawings, writings, copyright documents, labor contracts, business books, labor contract closing documents, backup tapes and film negatives.